Today's card I made for Everybody Art Challenge # 23 The theme this week was shabby. While I don't make a lot of shabby cards ( I usually prefer clean designs) I do love the look of vintage cards. Now to my card. I used the cracked glass technique on the main image. You can find the tutorial here if you would like to try it. I had to use regular clear embossing powder since I don't have any UTEE so my cracked glass didn't turn out as good as I wanted it to. For this challenge I had to get out my sewing machine from under my stamp desk, it was collecting dust. Please excuse the crooked stitching, but I guess it fits well with the "shabby" challenge. LOL. Wow, you did a great job! I don't like the vintage style myself but your card is fabulous!!! This does have a vintage flair to it with the stitching and colors. Great minds DO think alike, don't they? Love the paper (duh!) and love the card...one of these day I should REALLY pull my sewing machine out and use it on my card...I usualy cheat with my piercing tool...but the stitches look awesome! Very nice card! Gorgeous work. Your cracked glass and stitching look fabulous. And your coloring rocks! This is so pretty! Beautiful coloring! Great job, Ellie! I do love the vintage look and you have really captured it here! I love the colors and the cracked glass. Your coloring is beautiful on this card. I love the softness of the card. Absolutely fabulous! Wow. Nice attention to detail! Stunning card! love the image and your coloring is awesome!!! I like the look of shabby but its not what I usually do either. Your turned out very nice! 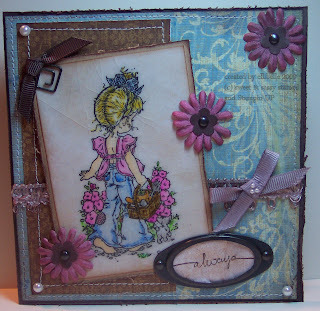 WOW...such a beautiful card, your coloring is great and i like the shabby look and the stitching. Wow this is a beautiful card ,great work.Thanks for joining this challenge. Die Karte ist so zauberhaft geworden. Tolle Papiere und Farben und super coloriert. Danke fürs mitmachen.